Designed for freeze protection and process temperature maintenance. The KE Cable heating element is tension wrapped and covered with two layers of nonflammable Polyimide Film applied in reverse directions, then heat fused for moisture protection. A stainless steel and tinned copper sheath is then added for additional protection and electrical ground return path. 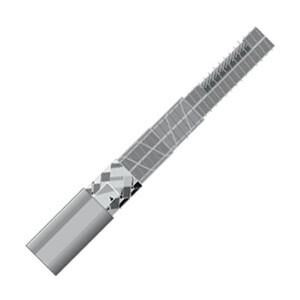 The sheath is enclosed in a minimum 20 mil PFA abrasion and chemical resistant extruded jacket. OMEGALUX™ KE Cable is a low Watt density electrical resistance heater. It is designed for freeze protection, viscosity and high temperature process control in Class 1, Groups B, C, and D, Division 2 Classified Areas as well as in corrosive environments. KE is used in asphalt plants, oil refineries, mines, chemical and petrochemical processing areas, other locations where corrosive atmospheres can occur. KE is equally suitable for applications in severe arctic cold. *Price per foot. When ordering specify desired length in feet. 25 foot minimum. **Maximum Circuit Lengths include end-to-end voltage variation of 10%. Longer runs may be used. Lengths are based on cable operating temperatures of 300°F. To complete your system the following accessories are recommended: (1) Termination kits for KE cable, (2) control options - we offer complete selection of controllers and thermostats.